Sitting down to watch a gameplay presentation of Star Wars Battlefront, we weren’t sure quite what to expect. A countdown ticked toward zero on screen, next to a ridiculously detailed Darth Vader helmet. When it finally hit zero, we found ourselves seeing things through the eyes of a Rebel fighter in a lush, wooded area, surrounded by towering trees. Leaves fell from their branches, and butterflies flitted about smaller bushes, which swayed in unison as the wind picked up. This all looked too familiar… this was the forest moon of Endor. After a moment, a team of rebels appeared on screen and speeder bikes started whizzing by. The desert planet Jakku was referenced briefly on stage during JJ Abrams’ panel at Star Wars Celebration, with the promise that we’d learn more about it at the convention. As it turns out, this is the setting of a pivotal battle set after the events of Return of the Jedi, which resulted in the war-torn desert landscape we saw in the first scene of The Force Awakens’ new teaser trailer. 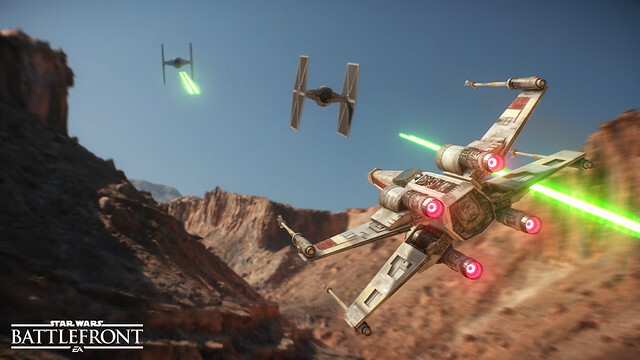 The only way fans will be able to experience the Battle of Jakku, in any medium, is by owning Star Wars Battlefront. It’s a free piece of additional content that will launch on December 8th — ten days before The Force Awakens hits theaters — but a pre-order will net you access a week earlier, on December 1st. Things got hectic fast. An AT-ST appeared and a Rebel fighter jetpacked past its front, firing a rocket into its cockpit to take it out. Overshields blinked on as the Rebels fought to fend off a Stormtrooper attack from within the trees above. Things went from bad to worse: A massive AT-AT lumbered into the action. “The armor’s too thick!” a teammate shouted as we fired a recently obtained missile launcher power-up toward the beast. Sure enough, the shell exploded uselessly against the machine’s hull. The Rebels ran underneath it, taking care not to find themselves underfoot, and made their way to an uplink station. A moment after activation, a squadron of fighters attacked from overhead, thankfully drawing fire away from the ground troops. The action shifted into a bunker alongside another Rebel, away from the increasing crossfire on the battlefield. The bunker felt lived in, but abandoned. Dust hung in the air, illuminated by shafts of light. The Rebels tiptoed through the hallways until — uh oh — one squadmember was lifted a couple feet off the ground, grasping at his throat. That signaled the entrance of Darth Vader himself, who swatted away incoming blaster fire with his iconic red lightsaber, casting a sinister light on his suit and reflective helmet with each flick of his wrist. Suddenly he was upon us, and the scene ended with a red flash. Niklas Fegraeus, Design Director on Star Wars Battlefront, told us that making a new Star Wars game is a dream for the team at DICE. “With the new film releasing later this year, it’s super exciting,” he gushed. 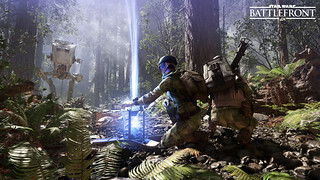 He went on to describe DICE’s vision for this new project as he showed us a photo of a child playing with an AT-ST toy: “Playing with our toys and creating our own battle fantasies… that became our vision for Star Wars Battlefront. “Being fans, authenticity is a pillar for us,” he continued before diving into impressive technical details. DICE had nigh unrestricted access to the Star Wars vault thanks to their close partnership with Lucasfilm. Fegraeus explained a process in which photos from all angles are taken of actual Star Wars film props, then imported and built inside the game. This technology is what allows us to see every last nick and notch in a Stormtroopers helmet, or the ridges and scratches on the grip of a blaster. These are actual pieces of physical gear that have effectively been imported into the in-game universe. Technical details mean nothing if a game isn’t fun, though. “Star Wars is about epic battles, good versus evil, imagination… all those things that make us want to step into that universe and be a part of it,” Fegraeus emphasized. Players can find power-ups during battle, ranging from missile launchers and overshields to more serious upgrades like a personal X-wing or walker, or even the ability to become a hero or villain like Darth Vader himself. These can be turning points in a battle; a skilled player controlling a Sith Lord is not a force to be trifled with. 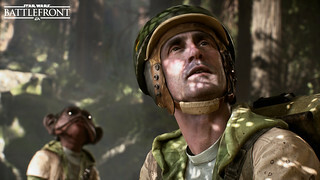 Star Wars Battlefront is primarily an online multiplayer game, but there are solo and co-op modes (both online and local split-screen) as well. “Missions” are designed to be highly replayable, and appealing to both casual and core players with different selectable difficulty levels. Co-op includes a new partner system that lets more experienced players help rookies get up to speed by sharing their unlocks and power-ups. DICE also confirmed that players can switch between a first-person or third-person viewpoint at will. This decision in particular, combined with so many of the different ways players can approach the battlefield, illustrates that player choice is high on DICE’s list of priorities. They’re working hard to create the most detailed and accurately represented Star Wars universe we’ve seen yet — what happens there is up to you. 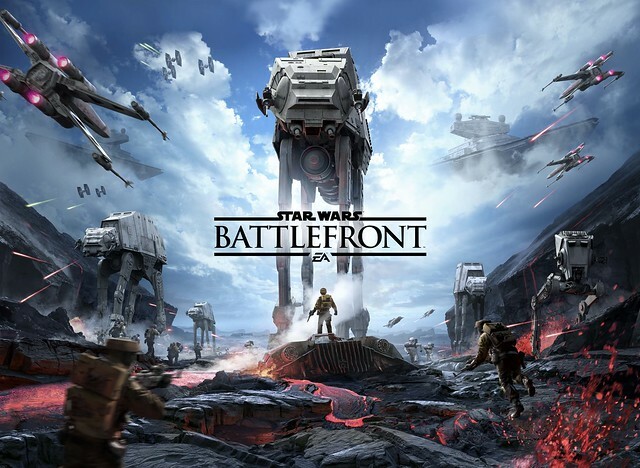 Star Wars Battlefront launches November 17th on PlayStation 4. Awesome about the third to first person switch being easy. Any news on Playstation getting any exclusive content with it having the marketing? Haven’t heard anything about exclusives, but stay tuned — as we learn more about SW Battlefront we’ll share it here! will there be any bundles coming and can split screen be done online as well? It looks insane! One of the best-looking games I’ve ever seen, no exaggeration. I can’t wait to see gameplay for myself. It talks of split screen (local and online) I hope that means 4 player split and not just 2 player split. I really like having game night with friends and there are fewer and fewer games for us to enjoy together. Almost NO AAA games. I didn’t see split-screen in action, but I’m really glad they’re doing it! I preordered the Deluxe Edition on the PS Store and it said it would come with 6 Themes, however only 1 is available to download. When are we going to get the other 5 themes? actual gameplay would be nice, Sony! Nypunk, you know they aren’t the ones actually making this game, right? IF the ability to play the entire game in third person is present, then they might have just caught my eye with this one. It sounds like it will be… but… you never know until the game is out. I can’t speak for DICE, but they made it pretty clear that you can switch between first and third person on the fly. Sounds promising to me! Well… I guess you can expect us, the Rebel Alliance Clan, to get into this. Wild speculation, though. Do check for updates on RebelAllianceClan (dot) com , we’ll probably be adding this on our site in the near future. You are part of the Rebel Alliance and a traitor. Breath taking work! I am excited for this, even if they nay-sayers complain about the lack of campaign, but that isn’t what Battlefront is about in my opinion. Plus, free DLC a month later for all! Can’t get better than that. .. By the way, can we expect any PlayStation Underground in the future on Star Wars Battlefront near launch? Thinking ahead of myself, I know, but this would be awesome to see the guys play it! Anyone else want offline instant action with bots, single player and split screen? Too bad this is “Game Engine” footage and Not actual gameplay footage as they can be quite different. If it looks this good in final form then that is spectacular. I am excited about this one, but I do wish they had a story mode. Hopefully the mission modes will have some sense of story. Today has left me with mixed feelings. Things I’m thrilled to hear: playable heroes, offline coop, 1st&3rd perspective switching. I can accept no single player and no space battles… However some news concerns me greatly: only 4 planets and no clone wars era as well as dlc and “post launch support”. IMO you can not have a star wars battlefront game without including all the BATTLEFRONTS. If I even hear a whisper of paid dlc to unlock more planets I’m done. I hope more planets and battles will be revealed before launch otherwise we have another destiny on our hands which I will not support. This would be very disappointing considering the game does look incredible and I very much want it to succeed. Please people don’t preorder… It only shows you will spend money based on marketing alone which is hurting game development! Will this be released for the PS3 or is it PS3 exclusive? Any word on prequel trilogy planets appearing in the game? We don’t need you to attempt to write up an artistic play-by-play of the video we just finished watching. Just get to the details. Providing your opinions is pointless because you aren’t allowed to ever say anything negative about a game, so just provide information. And just to be clear, Justin, I’m not bashing you. It’s just that your position doesn’t allow you the freedom to offer a truly honest review. This may be a truly amazing game, but you would praise it even if it bored you to death because that’s your job. So please, leave the hyping to the devs and publishers. We come here for information. When we want (honest) reviews, we read them on other websites or watch them on YouTube. Will I be able to make my own character?? I just hope that it will be good. I was hoping there would be a conquest mode like they had in Battlefront 2. That was a lot of fun and lasted for a while. He was describing the gameplay he saw on the show floor. Not the in-game engine video they released. If you watch the video and read the post, you’ll notice major differences. Example, 1st/3rd person switching and the whole bunker section. We never saw that. I’ve seen some Star Wars cinematic trailers but where is the gameplay video? At this point I think I’m numb to hype machine. I’m also “over” the “exclusive” pre-order trinkets. I really hope DICE makes a good game. will it be playable on day one or it will be an unplayable mess like battlefield 4 was? @5, I would also like to see 4 player splitscreen co-op. Warhawk is just like Battlefield and it’s the only game that’s ever had 4 player splitscreen online for a game like this. I thought Warhawk would be the first of many, but it’s the ONLY one. Battlefront definitely has the potential to bring 4p splitscreen back to a Battlefield-esque game, because if Warhawk could easily do this on PS3, then why not the immensely more powerful PS4? I know Battlefront always has been a multiplayer-centric franchise, but at least Battlefront II included a campaign/conquest to inject some variety. At least add a bots mode so we can play offline. Idk about u guys but I’d much prefer Star Wars 1313 or please Bioware make another star wars game. I want explore the fascinating universe and experience dramatic cchoices. I’d rather Mass Effect with star wars skin than titanfall. How about we crank out Mass Effect 4 ea? I really hope there will be an offline splitscreen component to this game. The Lord of the Rings Conquest is my favorite game of all time: swords and melee combat combos is where its at. However, the online got shut down by EA only a year after its release but the splitscreen campaigns and instant action are still really really fun to play. Recently its been freezing in splitscreen on us for some reason (anyone else with Conquest have this problem or know how to fix it?) but that’s beside the point. I hope there will be some good offline splitscreen modes. Also can we play as a saber wielding class instead of guns or maybe hold a melee weapon in one hand and a gun in the other like an Assault Space Marine? @Gscrorpio14, The Lord of the Rings Conquest is one of my favorite games of all time as well, next to Gran Turismo 3. My favorite class is the scout, love the cloak and backstab. If they cannot be bothered making a proper single player campaign game, then I cannot be bothered buying game, rent from boomerang then send it back. Will it be made for ps3? If not can you make it for it please! @BBOYbboy13, Nice! Its an awesome game. I wish they didn’t shut down the servers, I would still be playing it online to this day. Does it freeze on you in splitscreen mode? Just recently I’ve noticed anytime the 2 players are close to each other on screen in combat it freezes and I have to press the power button to shut it off. Sorry Uncharted 4, this is now the console bundle I’m holding out for. Nice and all but enough with the drooling over the fake footage…waiting to see actual gameplay.I’m quite interested in the 3rd person view and the offline missions.Also get rid of this battle of jakku talking…no one needs that in the game just to spoil the SW universe like the new crappy movie will…….well true SW fans dont need that. Will we be able to purchase a Star Wars Battlefront PS4 console at any time?